Links to the full report and some of its individual sections are provided below (Adobe PDF files). Some of the key findings Sacraments Today: Belief and Practice among US. Catholics are noted below (click images to see larger versions). For the complete ste of major findings please download the Executive Summary or Full Report. Eighty-four percent of adult Catholics entered the Church as infants. Eight percent were baptized as children, 1 percent as teens, and 7 percent were received into the Church as adults (75 percent of these adults went through the Rite of Christian Initiation of Adults or RCIA). 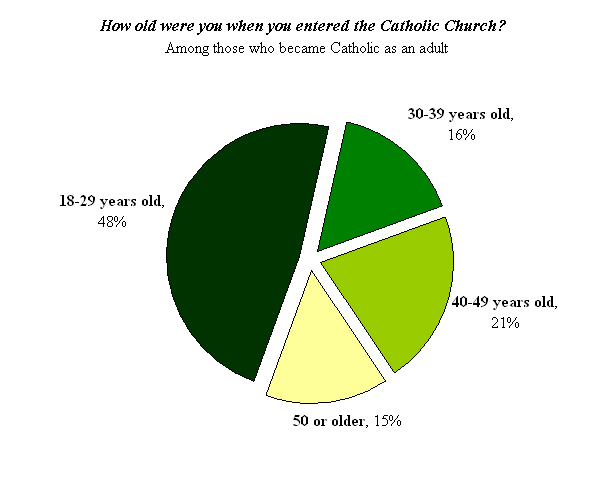 Nearly half of the adult Catholics who entered the Church as adults (48 percent) did so between the ages of 18 and 29. 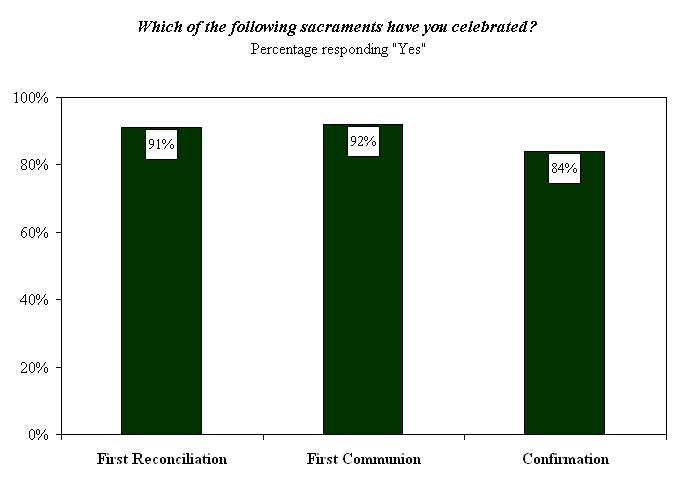 About nine in ten adult Catholics have celebrated their First Communion/Eucharist or their First Reconciliation. Slightly fewer, 84 percent, have been confirmed. 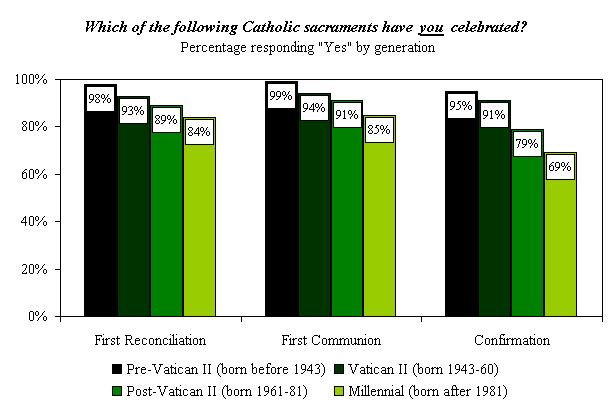 Younger Catholics are less likely than older Catholics to have celebrated First Communion, First Reconciliation, or Confirmation. Overall, 53 percent of adult Catholics are married. 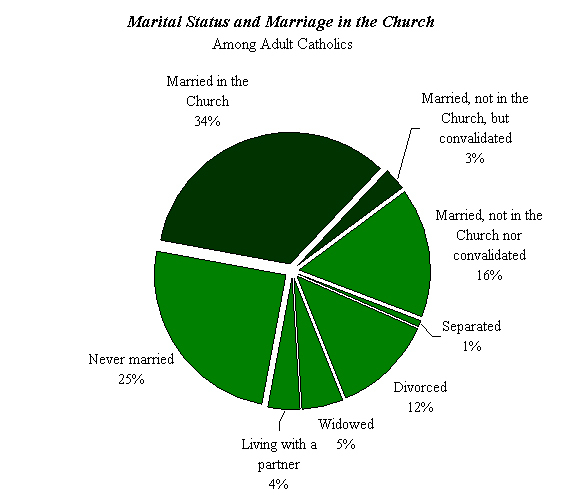 Two-thirds of married Catholics were married in the Church. 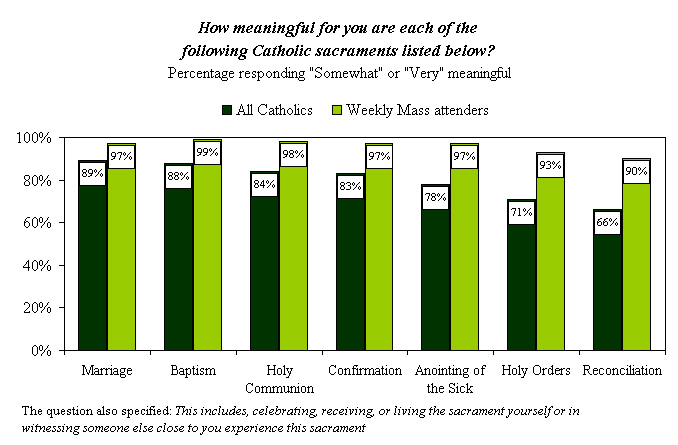 Catholics attending Mass at least once a weekly are more likely than all Catholics in general to find all seven sacraments “somewhat” or “very” meaningful to them. 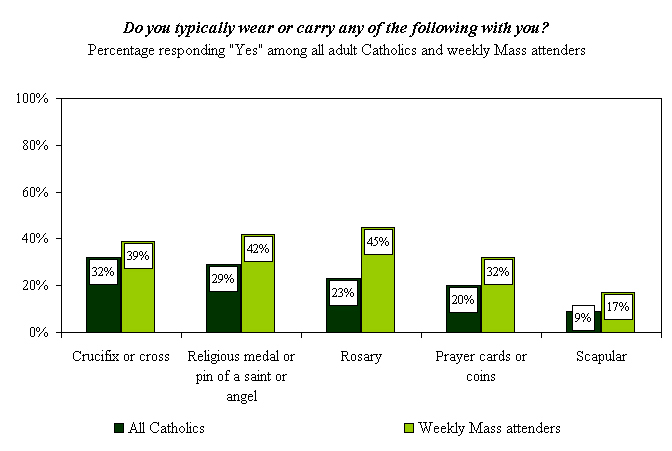 Twenty-three percent of adult Catholics say they attend Mass every week. 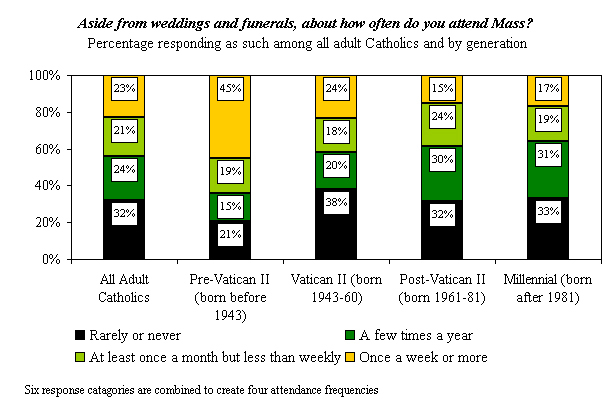 Older Catholics are more likely than younger Catholics to attend every week. 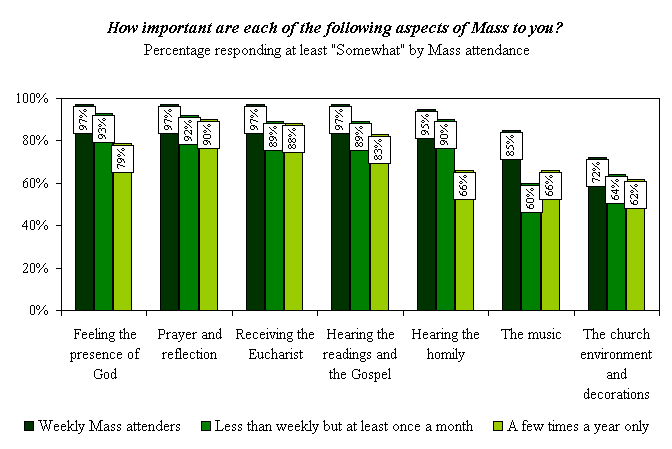 Catholics attending Mass at least once a month find many aspects of the Mass more important than those attending Mass less often. 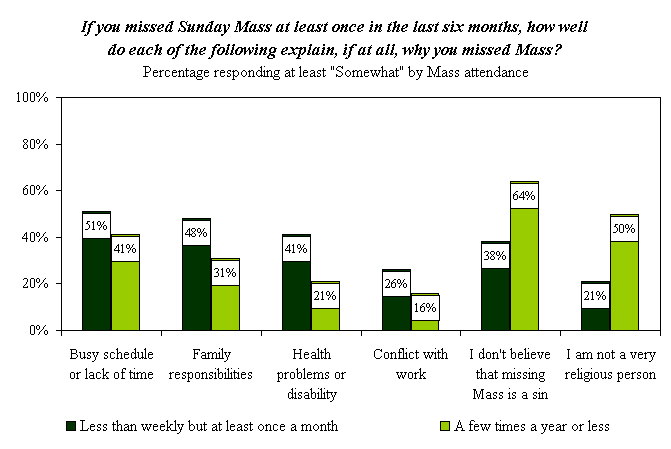 Among Catholics who do not attend Mass weekly, distinct differences in the reasons cited for missing Mass are related to their frequency of Mass attendance. For some it is an issue of schedules, health, or other responsibilities, while for others the reason is related to their attitudes about their faith. 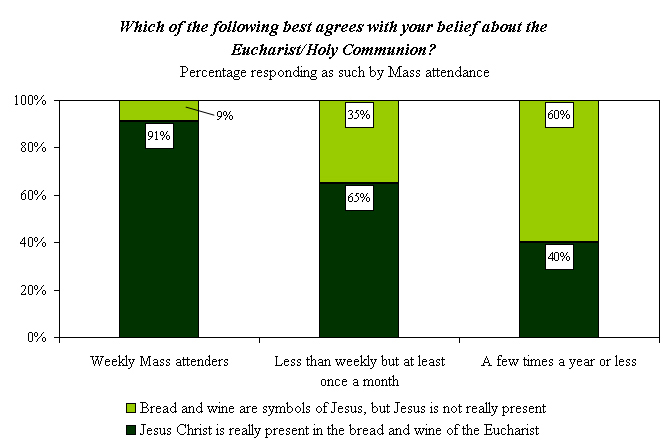 Nine in ten weekly Mass attendees (91 percent) say they believe that Jesus Christ is really present in the Eucharist, compared to two-thirds of those who attend Mass less than weekly but at least once a month (65 percent), and four in ten of those attending Mass a few times a year or less (40 percent). 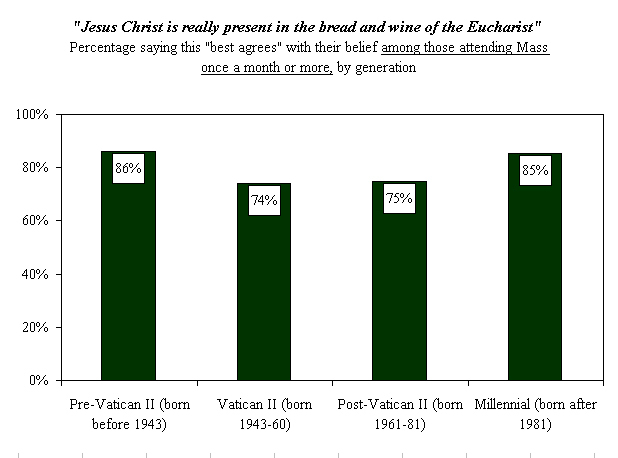 Among Catholics attending Mass at least once a month, the youngest generation of Catholics (born after 1981) has similar beliefs about the Eucharist as Pre-Vatican II Generation Catholics (born before 1943). 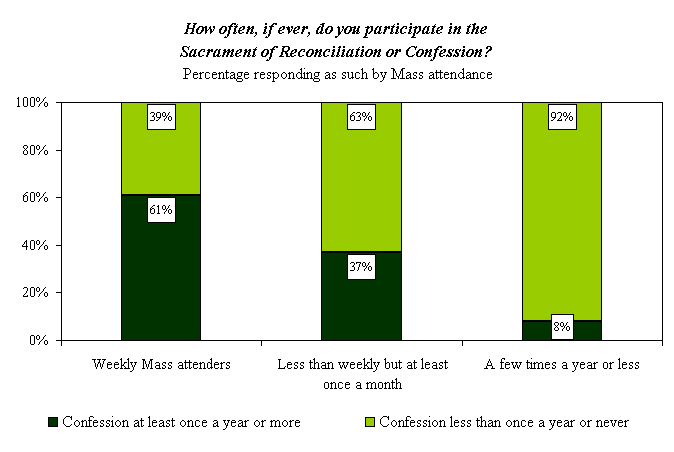 More than six in ten weekly Mass attenders (62 percent) say they participate in Reconciliation at least once a year, compared to 37 percent of those attending Mass less than weekly but at least once a month and only 6 percent of those attending less often. 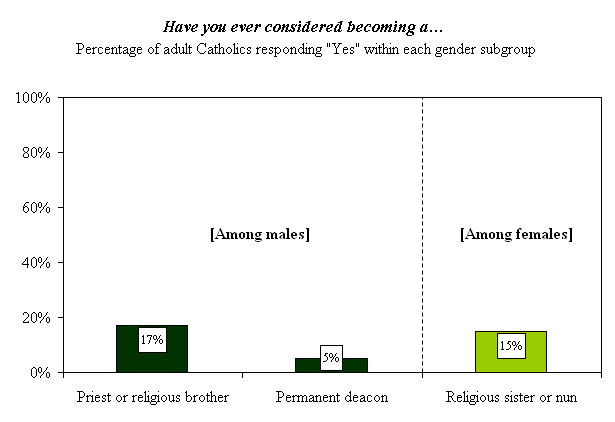 About one in six Catholic men (17 percent) have ever considered becoming a priest or religious brother. Very few Catholic men, 5 percent, have ever given any consideration to becoming a permanent deacon. Fifteen percent of Catholic women have ever considered becoming a nun or religious sister. Respondents attending Mass weekly are more likely to carry a rosary (45 percent) or religious medal (42 percent) than a cross (39 percent). Catholics attending Mass less often are less likely to wear or carry any of these items. 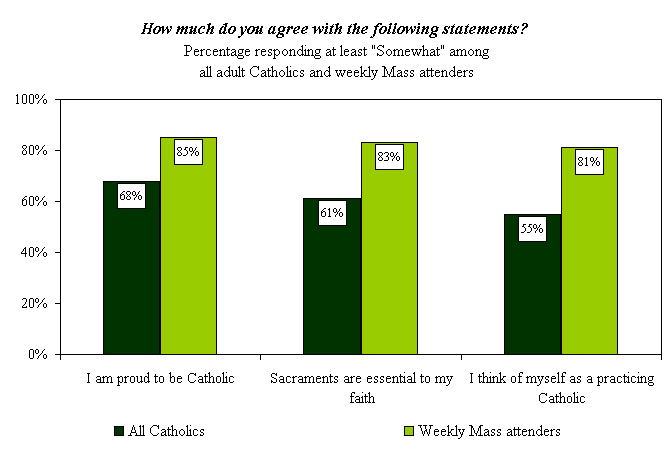 More than eight in ten Catholics attending Mass weekly agree that they are proud to be Catholic, believe sacraments are essential to their faith, and think of themselves as practicing Catholics. Less frequent Mass attenders are less likely to agree with these statements. 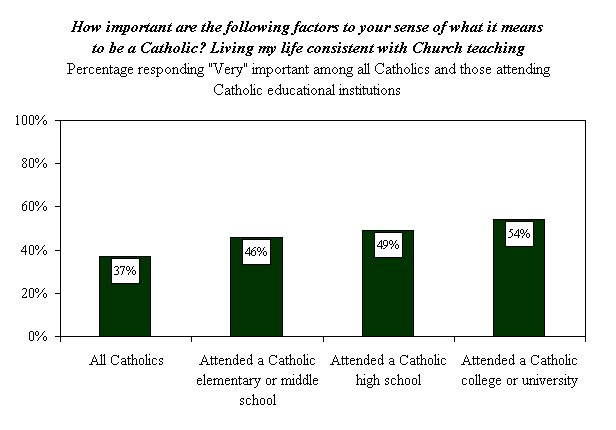 Those who have attended Catholic educational institutions are among the most likely to say that “living my life consistent with Church teaching” is “very” important to their sense of what it means to be Catholic. 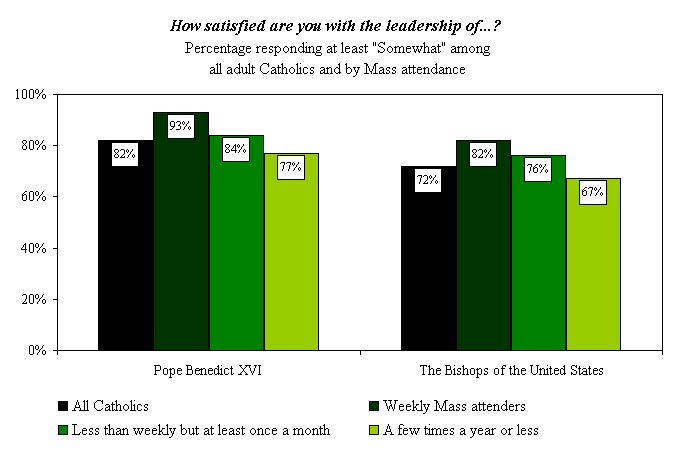 More than eight in ten Catholics (82 percent) describe themselves as “somewhat” or “very” satisfied with the leadership of Pope Benedict XVI. More than seven in ten (72 percent) are at least “somewhat” satisfied with the leadership of the Bishops of the United States. "Lenten Rituals Still Widely Practiced, GU Study Says" The Hoya, March 17, 2008. "We Live It Every Day" The Washington Post, April 9, 2008. "America's Roman Catholic Population" Reuters, April 10, 2008. 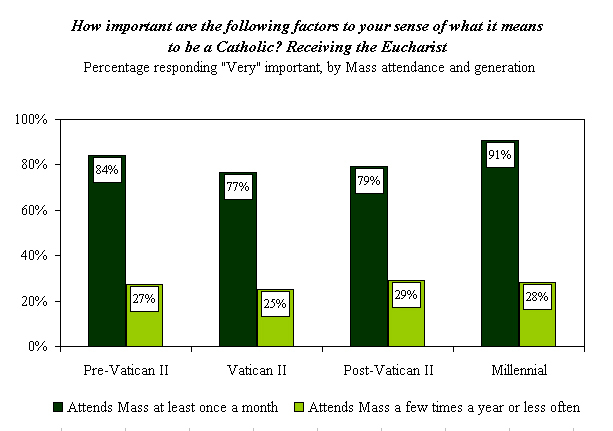 "Survey Assesses Catholics' Beliefs, Practices on Mass, Sacraments" Catholic News Service, April 11, 2008. "Poll: Catholics Embrace Faith, Not Mass" The Associated Press, April 13, 2008. "Poll: 8 in 10 US Catholics Satisfied With Pope" ZENIT News Service, April 13, 2008. 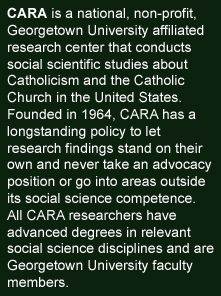 "Pope, Bishops Get High Marks for Leadership, CARA Poll Finds" USCCB Office of Media Relations, April 13, 2008. "Challenges for American Church" The Washington Times, April 13, 2008. "Survey: Catholics Like Benedict" The Los Angeles Times, April 13, 2008. "Pope to Visit US for First Time; Poll Shows Few Catholics Attend Mass" NBC News, April 13, 2008. "Uncertain Church Awaits Pope in U.S." The New York Times, April 14, 2008. "As Visit Nears, Sexual Abuse Victims Group Plans Protest" The Washington Post, April 14, 2008. "Poll Shows Most Catholics Satisfied With Pope Benedict" Fox News, April 14, 2008. "The Pope Has an Eager Audience in Youth" U.S. News & World Report, April 14, 2008. "Study Explores Support for Vocations, Response to Decline in Priests" Catholic News Service, April 14, 2008. 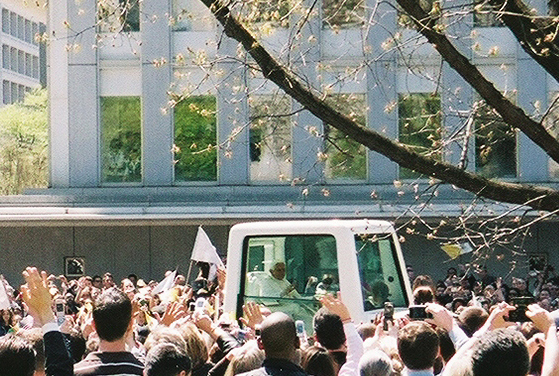 "Pope's Visit Excites Lay People but Doesn't Erase Problems" USAToday, April 14, 2008. "Catholics Highly Regard Benedict; But On Eve of His First U.S. Visit, Their Beliefs Drift" USAToday, April 14, 2008. "Poll: Catholics Waver on Faith but Like Pope" USAToday, April 14, 2008. "Pope's First U.S. Visit " CBS Evening News, April 14, 2008. "What the Church Needs Now is Love, Sweet Love" Religion News Service, April 14, 2008. "Pope: 'Ashamed' of Clergy Abuse Scandal" The Associated Press, April 15, 2008. "Dispirited U.S. Catholics Hope Pope Affirms Pain; Hundreds of Parishes Are Being Closed" The New York Times, April 15, 2008. "What Catholics Need From Pope: A Little Love" Chicago Sun-Times, April 15, 2008. "President Outpolls Pope" The Washington Times, April 15, 2008. "Pope Benedict XVI Lands in America" The Associated Press, April 15, 2008. "Pope Lands in the U.S., Apologizes for Priest Abuse" CTV National News, April 15, 2008. "Spiritual Renewal" The Monitor, April 16, 2008. "Hundreds Travel to Visit Benedict" San Mateo Daily Journal, April 16, 2008. "Welcome to America, Pope Benedict" The Valley Independent, April 16, 2008. "Pope Faces Complexities of American Catholicism" The Gainseville Sun, April 16, 2008. "Pope Says U.S. Society Can Undermine Catholic Faith" Reuters, April 16, 2008. "The Pope and You" The Daily Colonial, April 17, 2008. "Catholics Approve of Pope Benedict, But Don't Attend Mass" Catholic News Agency, April 17, 2008. "Pope Faces Many Issues in U.S. Visit" The Daily Star, April 17, 2008. "Interview; Catholic Church: The Millenial Generation" National Public Radio (WNPR Connecticut), April 17, 2008. "Pope Has Chance to Inspire Youths" The Columbus Dispatch, April 18, 2008. "Pope Offers Message of Hope" Pittsburgh Tribune-Review, April 18, 2008. "Papal Visit Puts Spotlight On Decline in Confession" The Cleveland Plain Dealer, April 18, 2008. "Pope Draws Faithful From Region" The Erie Times-News, April 18, 2008. "Pope Laments Abuse Scandal in Mass with Priests" The Cleveland Plain Dealer, April 18, 2008. "Reaching Across Generations" Newsweek, April 18, 2008. "Catholic Population in US is Changing, Depends on its Youth and Immigrants" NBC News, April 19, 2008. "Pope Shines Light On Church's Dark Issue, Offers Hope to Its Victims" New Brunswick Home News Tribune, April 21, 2008. "Young Hang with Pope: Benedict XVI Connects with Next Generation of U.S. Catholics" The Associated Press, April 21, 2008. "The Center for Applied Research in the Apostolate Reports Big Differences in the Sacramental Practices among the Different Generations of U.S. Catholics" Origins (Vol. 37, No. 45), April 24, 2008.